Cat ownership comes with a lot of perks, but also with tons of fur, dander and dirt. Although felines spend most of their waking life grooming, which makes them pretty clean animals, they still can create huge mess around the house. Keeping your home clean is essential for both your health and your cat’s well being. If you are trying to figure out how to manage the chaos and preserve your peace of mind, here are a couple of tips. When you own a cat, spillages, dust and floors covered with pet hair are not something unusual. Although you can’t completely prevent the stains and the everyday dirt, you can make domestic cleaning a little bit easier. With the right products and approach, you can avoid any permanent damages on your carpeting, upholstery and other surfaces. •Regular maintenance – keep the dander, dust and pet hair at bay by vacuuming at least once a week. Keep in mind that vacuum cleaners not only collect particles, but they also spread allergens and pollute the indoors air. It’s recommendable to use an appliance with HEPA filters. •Remove the pet hair from your upholstery – to win the battle with the pet hair you need large quantity of lint rollers. These can be expensive and inconvenient, especially when cleaning the furniture. A rubber glove is a quick and easy fix. Plus, it’s more efficient because you can wipe up the surface right away, wash the glove and then use it again. Conventional cleaners may be effective against persistent stains, but they also contain volatile ingredients that may be hazardous for your feline. Pick a safe and pet-friendly alternative. Eco-friendly ingredients such as vinegar and baking soda can help you clear away most types of stains. For urine spots, use enzyme bases cleaning products. If your cat is urinating indoors, this may be a sign for health issue, usually diabetes, kidney or urinary infections. In this case, you need to consult with your vet. Of course, it may also be related to some behavioural reasons like new surroundings, litter box aversion or new pets. Punishment is not the answer, as it will make your furry friend more unsettled. Be patient and find a solution for the particular situation. The best way to maintain a clean home is by preventing the mess to occur on a first place. •Brush your cat frequently – bathing your pet too often can irritate their skin and can be harmful for your furry friend. Instead brush and comb daily or weekly to remove the excess of dead hair and dander. This will minimize the amount of residue lying around your home. •Stain-proof their eating zone – the area where your feline takes a snack can get really dirty. Put a cloth or papers under the bowls with water and food to preserve the floor spotless. •Pay attention to the kitty litter– place the kitty litter box in an area with less foot traffic. Otherwise the crunchy litter particles will get dispersed all over your home. Keeping up with your kitty may be hard sometimes, but with the right approach and cleaning products, you will be able to preserve your home clean. Yes the litter box does make a mess.I wish there was some way to stop that! Peek-a-boo. 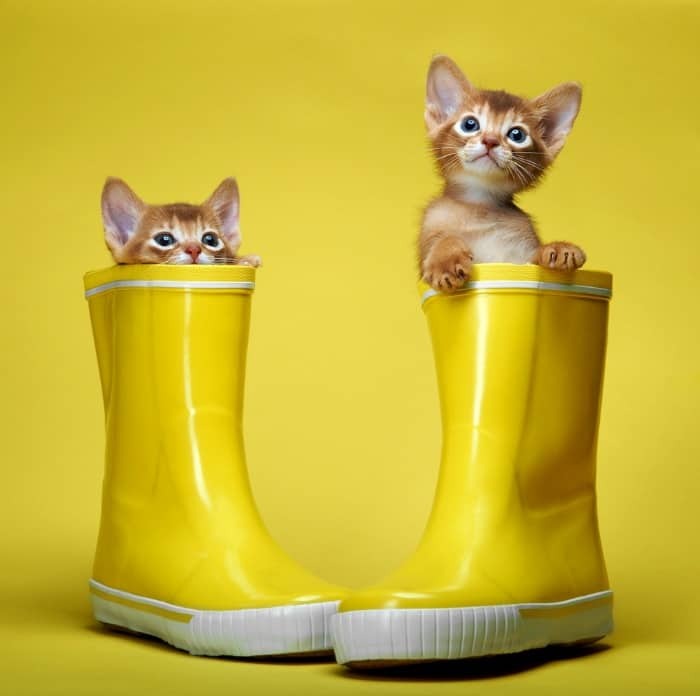 Those cats in the boots are so cute. Great picture. Cat hair is a huge problem in my house. Just one cat, but lots of hair.